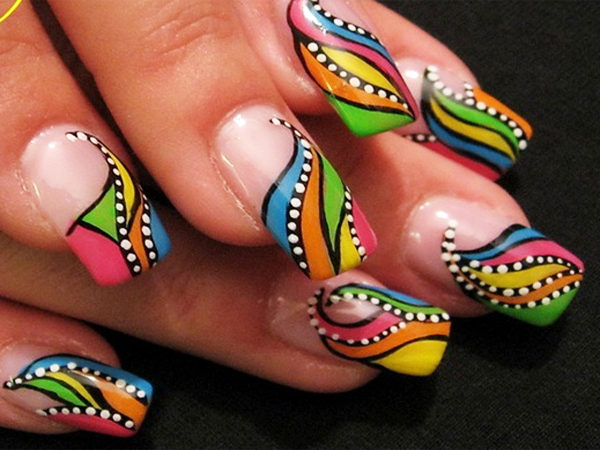 Take a look at 17 colorful and latest nail art designs to flaunt during Navratri! The ongoing Navratri festival is all about fasting, feasting and praying to the almighty. During these nine days, garba lovers celebrate life by dancing away to glory. So, obviously, all the fun of dressing up in Indian, ethnic, traditional, Indo-Western fusion attire adds to all the festive excitement. Celebrations are in full swing and why shouldn’t they be? Afterall, it is Navratri. If you have already decided on your outfit(s), makeup looks have been thought-through, hairstyles are frozen upon, then Zuri completes your ultimate festive look with 17 gorgeous nail art designs. Choose from best of the best, vibrant designs and flaunt them for the next few days! Who says, Holi is the only festival of colors? Well, there also happens to be nine different colors for Navratri. The first day is red, followed by blue, yellow, green, gray, orange, white, pink for Saptami, sky blue for Ashtami and purple for Navami. So, paint your nails in stunning colors associated with these nine days or just have them all in one go. Do it the way you like. Opt for multiple colors, floral motifs, zig zag, geometrical patterns, latest retro designs and decorate your hands especially for the perfect Dandiya night. Don’t forget to accessorize with bangles that compliment your outfit. Your hands should be freshly manicured. You can do this at home or go to a salon. Keep your nails healthy. Drink plenty of water and eat a good diet to ensure your nails don’t turn yellow. Often, excessive nail art, nail polish application is blamed for the same. But, that’s not true. Keep your nails short if the nail art design you have opted for is for short nails. Likewise, long or medium length if you have a specific nail art design in mind that is ideal for a particular nail length. Brittle nails break way too often. The best way to avoid nails from breaking is by applying hand lotion at night before going to bed, don’t leave nail polish on for long, and use a good nail polish remover. Don’t get rid of cuticles. Just manage/maintain them by gently pushing back with a cloth when they are wet. The reason why you shouldn’t is because this layer between your nail and skin, shields your nail from water, bacteria, and other impurities. So, now that we know how to keep our nails healthy and naturally shining, the nail art design application will only enhance the look of our hands, thereby adding to the overall Navratri look. Go trendy with these amazing and latest nail art designs. Have fun with colors!